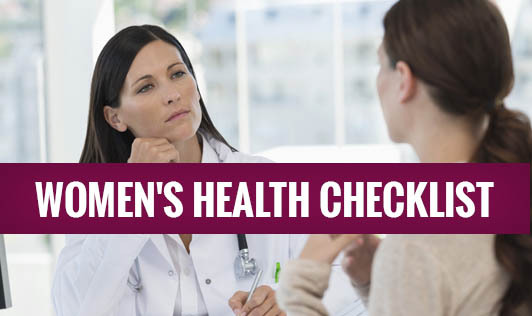 As women, one of the things that often fall through the cracks of your busy life is regular checkups with your doctor. Whether you are in your 20s or your 70s, there are certain medical and screening tests which help in the early detection of diseases that are usually easier to treat and enable a better health outcome. Obesity: The Body Mass Index (BMI - measurement based on height and weight) gives you an idea as to whether you are underweight or overweight or obese. A BMI of 23 or greater indicates that a woman is overweight and BMI of 25 or higher is obese, which can further lead to lifestyle diseases like diabetes and heart disease. Bilateral Mammogram: Checking your own breasts for lumps or other changes is called a breast self-exam. Studies so far have not shown that breast self-exam alone reduces the numbers of deaths from breast cancer. Hence a bilateral mammogram is an effective procedure, which screens both the breasts to detect and diagnose diseases of the breast. Mammograms play a key role in early breast cancer detection and help decrease breast cancer deaths. Ultrasound Abdomen and Pelvis: Ultrasound examinations help to diagnose the symptoms experienced by women such as pelvic pain, abnormal bleeding, menstrual problems, and help to identify ovarian cysts, uterine fibroids, ovarian or uterine cancers. Pap Smear: A pap smear (Pap test) is a test of a sample of cells taken from a woman's cervix. It is the best tool to detect precancerous conditions and hidden, small tumors that may lead to cervical cancer. If detected early, cervical cancer can be cured. In women over 30, the pap smear may be combined with a test for Human Papilloma Virus (HPV) - a common sexually transmitted infection that can cause cervical cancer in some women. Thyroid profile: Thyroid hormone tests are often the test of choice to evaluate thyroid function and/or symptoms of hyperthyroidism or hypothyroidism. The doctor may order a TSH test for a woman with symptoms of increased heart rate, anxiety, weight loss/gain, difficulty in sleeping, weakness, hair loss, excessive fatigue, or menstrual irregularity. Complete Hemogram Tests: Complete Blood Count is used as a broad screening test to check for anemia, infection, and many other diseases. Bone Mineral Density: As women enter menopause, a bone mineral density test is essential to look for evidence of osteoporosis, especially if there's a family history of the disease. Here's some good news- healthy lifestyle choices such as eating a healthy diet and including physical activity in your daily routine can go a long way towards reducing women's health risks.